While we still have a ways to go before the advent of photon torpedoes and warp drives, Stony Brook University has just brought us one step closer to our Star Trek future with the unveiling of its immersive video projection system, the Reality Deck. What? Holodeck was already taken. The Reality Deck is the world's first immersive 1.5 gigapixel-resolution display. Located at the Center of Excellence in Wireless and Information Technology (CEWIT) at New York's Stony Brook University, this unique facility is funded by a $1.4 million research grant from the National Science Foundation and a matching $600,000 grant from the University itself. The facility is designed to help scientists visualize the massive amounts of information in the present and future eras of Big Data—everything from massive image collections covering hundreds or thousand years of art history to creating a walk-through virtual colonoscopy based on the University Medical Center's new 320-slice computed tomography (CT) scanner. Satellite imaging, climate modeling, astronomical applications, crime monitoring, and news analyses are all possible. "What a wonderful validation of the cutting edge research going on in imaging at CEWIT," said President Samuel L. Stanley, Jr., M.D. in a press statement. "This support from the NSF will help us break new ground in a number of critical areas including advanced medical imaging." 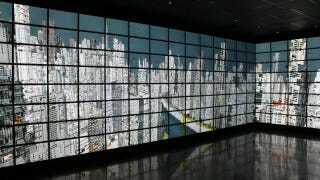 The Reality Deck lines its 40' x 30' x 11' interior walls with a total of 416 Samsung LCD displays running at 2560 x 1440 and powered by an 18-node graphics computing cluster, each with dual hex-core Intel Xeon CPUs, 4 AMD Firepro V9800 GPUs (each driving six monitors, for a total of 24 monitors and 90 MP of visual data per node), 48 GB of RAM and 1 TB of local storage. The result: a resolution that nearly matches that of the human eye with 1.5 billion pixels of information and is magnitudes greater than similar multi-panel displays. What's more, it contains a suite of sensors that feed user information into a state-of-the-art NaturalPoint tracking system and is paired to a user-carried Microsoft Pixelsense table that work in tandem to adjust the image as the user moves about the room. Step closer to a wall to zoom in, turn your head to pan, or step back into the center of the room to pull out to a panorama. The system is even robust enough to handle multiple users. "In the Reality Deck, data is displayed with an unprecedented amount of resolution that saturates the human eye, provides 20/20 vision, and renders traditional panning or zooming motions obsolete," Dr. Kaufman added. "Users just have to walk up to a display in order to resolve the minutiae, while walking back in order to appreciate the context that completely surrounds them." And he doesn't just mean the visuals, the Reality Deck also features 22.4 positional audio system.